Before moving to the Southwest, I wasn't really aware of Our Lady of Guadalupe. She is a popular Marian image here in Arizona, so I got to know her after moving here. I love the story of St. Juan Diego and his interaction with Our Lady -- his faith which had him traveling far distances for Mass, his perseverance, and then the lovely miracle of roses to convince the Church that he was telling the truth. 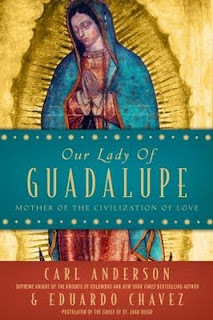 When The Catholic Company had Our Lady of Guadalupe- Mother of the Civilization available through their review program, I jumped at the chance to read it. It is an extremely thorough explanation and discussion of St. Juan Diego, the story of Our Lady of Guadalupe, the miracles that happened, and all the research and study that went into proving the miracles. I didn't realize that St. Juan Diego didn't become a saint until Pope John Paul II canonized him in July of 2002. I thought he had been a saint for much longer than that! There is detailed explanations of every detail of the painting on St. Juan Diego's tilma and the significance of each part. In addition to all the information about Our Lady, it also includes information about Mexico at the time and the history of the region. The book ends with a detailed time line, a collection of prayers, an extensive bibliography, and detailed notes. I have told the story of Our Lady of Guadalupe many times to my children, but in a very simple form. This book filled in all the details, as well as providing excellent information about the research and study that goes into determining miracles. I found it extremely informative and very well-written. I highly recommend this book. This review was written as part of the Catholic book Reviewer program from The Catholic Company. In exchange for my honest review, I received a copy of the book. Visit The Catholic Company to find more information on Our Lady of Guadalupe- Mother of the Civilization .